Wreck Diving - SS Yongala, HMAS Brisbane, Hmas Swan, Hmas Perth and HMAS Adelaide. The main access points for scuba diving on the Great Barrier Reef are Port Douglas, Cairns and Airlie Beach all located in central or northern Queensland Australia. This cruise departs daily for the Port Douglas Great Barrier Reef Day Dive cruise. Dive sites that are not visited by any of the Cairns day dive boats. You will have travelled a long way for diving Port Douglas dive sites on the Great Barrier Reef and this may be the only opportunity you get, at least for several years for scuba diving on the Great Barrier Reef. For scuba divers this is a wonderful experience; not only for the underwater beauty but the boat itself is custom built for scuba divers featuring custom equipment stowage and dressing area, easy plaform water entry, freshwater washdown facility and modern well maintained scuba equipment. You will need to book in advance if you want to scuba dive either as a certified diver or as an introductory diver so that the correct amount of equipment can be embarked to cater for the number of divers on board. Cairns is a much larger Australian city with fantastic marine facilities making it the most popular start point for the Cairns Liveaboard Dive Trip or day dive cruises. Cairns is also the departure port for the Coral Sea Diving Liveaboard vessel Spirit of Freedom. Spirit of Freedom is one of Australia's premier dive boats. The best Spirit cruise incorporates a flight over sections of the Great Barrier Reef and Coral Sea that is nothing short of breathtaking. The Coral Sea liveaboard is for the serious and experienced who are seeking one of lifes true adventures. 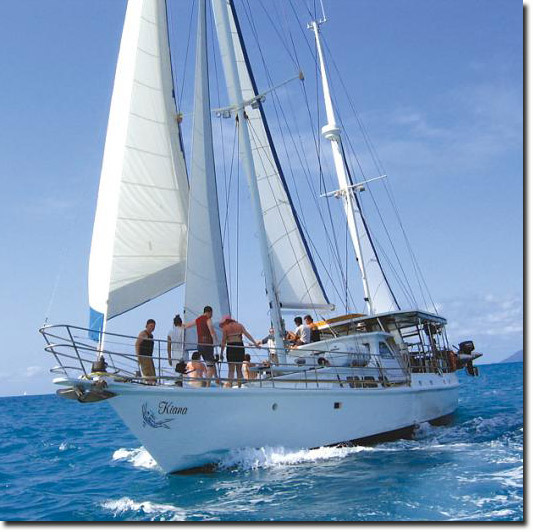 The most popular dive cruise after the Cairns Day Dive Trip is the Cairns Liveaboard Dive Trip. This cruise is also very popular with divers visiting Australia who want to complete their Cairns PADI Advanced Course and also with new divers combining their Cairns PADI Open Water with some great practical diving experience. Airlie Beach is the second most popular depature point for Great Barrier Reef dive liveaboards and day dives in Australia. The Best Whitsunday Islands Dive Sites are also very popular with divers because they are protected from prevailing south easterly winds which can be very strong at certain times of the year. The Australian autumn, winter and spring are the best times to dive the Whitsundays; when the tides are smaller and water clarity is higher. This does not stop the majority of tourists coming in December January and February when tides are extremely high (6 metres) and the Queensland wet season is in full swing. The is the world reknowned Yongala wreck dive - acknowledged as one of the world's greatest wreck dives. 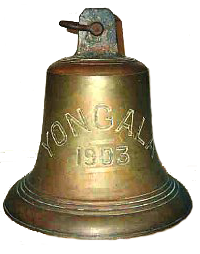 The S.S. YONGALA sank in a cyclone on the 23rd March 1911. The wreck was not discovered for almost 50 years, not being positively identified until 1958. Yongala now lies on her starboard side in 14-28 metres of water, an ideal depth for scuba diving. 109m long, Yongala is the largest and most intact, historic shipwreck in Australian waters and just 30 minutes by fast RIB (Yongala Express) from Alva beach at Ayr. To dive Yongala is an absolute wonder of marine life and mystery. The Yongala wreck dive represents much more than just another entry in your dive log. It is potentially the most captivating underwater experience that you will ever have. 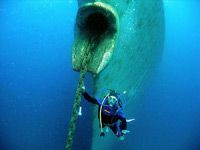 The 109 metre wreck lies on her starboard side 11 nautical miles (20 kilometres) east of Alva Beach near Ayr. The depth of water at the site is 14 metres at the shallowest point and 28 metres at the deepest making the Yongala wreck dive both interesting and challenging. A large representation of the 1500 fish species and 350 species of coral known to inhabit the Great Barrier Reef can be found on Yongala which is now an artificial reef. Fish life on the wreck is many times more prolific than on a normal Great Barrier Reef dive. The Yongala wreck dive is an "Intermediate" divesite. To dive Yongala divers need to be comfortable in open ocean conditions that can be challenging in terms of current and sea state. Open Water divers will require a minimum of 6 dives and will need to complete Deep Dive training during the first dive. This training counts towards the PADI Advanced Diver qualification when the Advanced Manual is purchased. Novice divers (with less than 20 dives) should ensure they have refreshed their skills within the last 6 months and will be guided by the experienced crew to ensure a safe, memorable and fun dive. More experienced and in date divers can choose to dive with a buddy or take an instructor guided tour at no extra cost. Dive HMAS Brisbane wreck at Moolooabah 100 kilometres north of Brisbane. Former Royal Australian Navy Guided Missile Destroyer (DDG) 41, HMAS Brisbane was scuttled by a team of explosives experts off the Queensland coast at Mooloolaba on 31 July 2005. Mooloolaba is easily accessible from Brisbane being located 100 kilometres north of that city on Australia's Sunshine Coast. Surfing is another water activity that is also very popular on the beach at Mooloolaba or at nearby beaches such as Alexandra Headland, Coolum and Maroochydore. Divers are transported to the wreck site on the 11 metre dive vessel 2- Ezy that is surveyed for 12 divers and four crew. Fresh and salt water showers, toilet and fridge/freezer and full sun and wind protection complete the amenities. Only 15 minutes to the wreck site and included is a courtesy bus pick up service for customers at Maroochydore and Mooloolaba. Guests coming from Noosa Heads have to use the commercial bus service to Maroochydore. It is a memorable sensation to dive on such an imposing structure in such a perfect scenario. The Brisbane wreck is rapidly gaining recognition as one of the best wreck dives in the world. Wreck/Cave Specialty Divers may do independent full penetration after initial orientation dives with a guide. PLEASE NOTE: All penetration divers must be accompanied by a dive guide and carry a torch! Subsequent dives MUST BE with an equally qualified dive buddy and carry a Wreck Reel and torch.